At First United Methodist Church, Palo alto. Main speaker - Emmett Carson, CEO of SV Community Foundation. Strong speech titled "Honoring Courageous Leadership and Compassion in the Face of Controversy"
People say we have entered in a post-racial society with Obama as President. Today, 12 states are enforcing stricter voting laws, which disproportionately affects minorities. 25% of African Americans today do not have government issued id. Last month, the Justice Dept announced the largest, residential fair lending settlement with CountryWide (now BoA) - $355 million for charging over 200,000 minorities more than white borrowers. The Sequoia school district places students who come from Ravenswood in remedial classes who get the same standard scores as students from the Menlo Park school district. Ended on a note of hope - story of a 30 year veteran and Sargent of the San Jose Police Dept. White big guy. Butted heads with the new independent police auditor - LaDoris Cordell (who told the story). She is a black woman. One evening, he comes to her office and tells her this story that occurred that afternoon - on the beat, they get a report of a purse being snatched. Suspect is a tall black man, in a black coat with a backpack. Another white police officer spots someone who matches that description entering a bus. He drags him out and a shouting match ensues. The sargent arrives at the scene. He explains to the suspect politely that he matched the description of a suspect and would be let go if the victim did not identify him. So 10 minutes later, the victim comes in and says he is not the one. This black man then apologizes to the Sargent for the earlier shouting march. The Sargent tells LaDoris that for the first time in 30 years, someone apologized even when they were innocent. When both sides show respect for each other, there is healing. LaDoris and the Sargent then hug each other. Even more healing. As he leaves, he says "I just had to tell you, I just had to tell you". 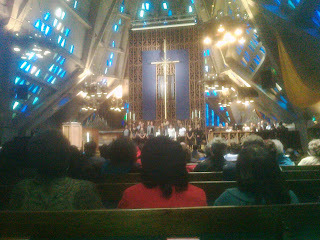 At the very end, we sang "We Shall Overcome" holding hands. All across the pews and even up in the pulpit area. 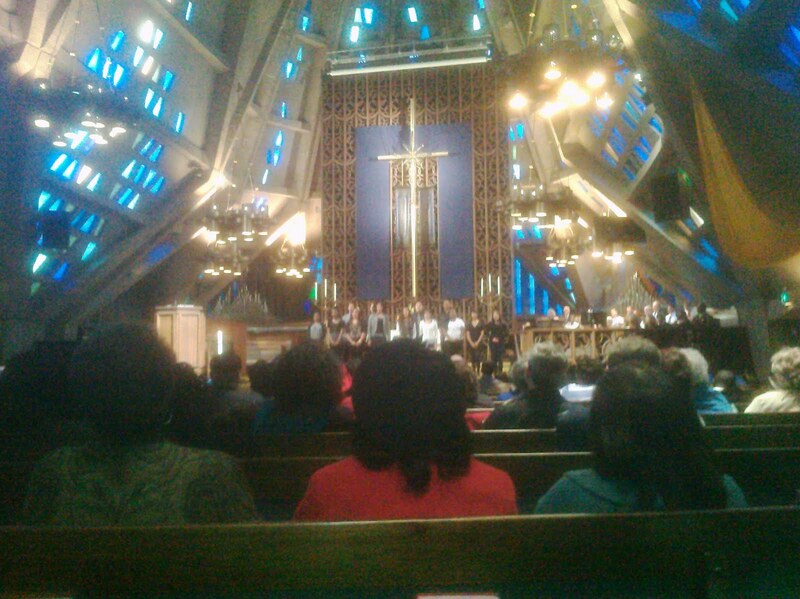 And then, older white folks join in the pulpit area. It was moving. Different races standing together, singing together, hoping together.